For the first time this year, Swing U is focusing on the greatest 8-counts in the history of partner dance: The Swingout! The Swingout is the basis for all both Lindy hop and West Coast Swing and is one of the fundamental concepts of every Swing dance. As always, we'll not only discuss the history of the Swingout, but we'll approach how to lead and follow both the basic and some sweet Swingout steps. April 12 - "Forward & Back"
This week, we'll review the basic from last week, and continue to explore different ways to Swingout. This class will focus on both the forward Swingout - with historical roots in early 1930s Harlem - and the back Swingout - which is the basis for the West Coast Swing whip. By the end of this class, you'll be able to Swingout any direction you want - and dance any "style" of Swing - be it West Coast, Lindy hop, or something else! April 19 - "Outside & Inside"
Having explored the three major ways to dance a Swingout basic over the last two weeks, we'll spend this class focusing on different moves you can do out of the basic - specifically, the inside and outside turns. April 26 - "Swing U! 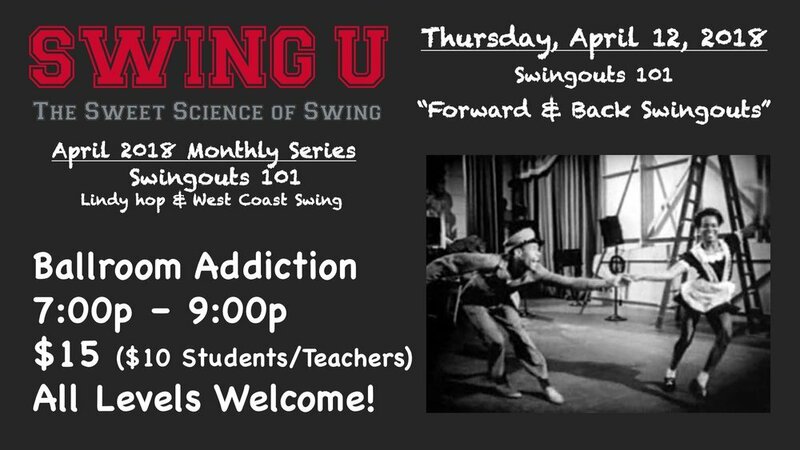 Lab: Style Your Swingout"
In a Swing U Tradition, the 4th Thursday of our series will be a Swing U! Lab, in which we review everything we've learned so far, practice it to music, and add a little styling flavor to increase the challenge. This class is intended to move at a faster pace than our other Swing U! classes.
" Week 4 - Swing U! Lab - "Style Your Swingout"
How are Swing U! classes structured? Each Swing U! class runs for 2 hours. The first 15 minutes is a footwork warm-up to music that allows your feet an opportunity to get comfortable on the dance floor and to the rhythm we are working with that day. The next 90 minutes is devoted to the specific techniques or movements. The final 15 minutes is a structured practice with music. We'll practice the movements of the day to music while rotating partners. Is Swing U! for me? Unlike other Swing dance classes, Swing U! is not designed to get you on the dance floor as quickly as possible. Therefore, this might not be the best class for those who are just looking for a few steps to bring to the dance floor. Additionally, the pace of each class is intended to ensure maximal understanding of the lesson; as such, we might proceed at a "slower" pace than other dance classes. And as a reminder, the Tortoise beat the Hare! If you are new to Swing dancing or just looking for an opportunity to add a few moves to your dancing repertoire, check out SwingDanceVegas' Friday night classes at Swinging at The Mint Tavern! Each Friday, we offer a Beginning Swing class at 7:30p, for only $10/week. What is the Swing U Lab? The Swing U Lab is a once-a-month class designed to get you practicing and applying the techniques and theories developed in the Swing U Class. Rather than the usual 2-4 moves that we explore in the Swing U Class, this Swing U Lab will often review concepts previously discussed in class and apply them with copious practice to music. The goal of the Lab is to provide a structured practice for transitioning between moves on the dance floor, so that you can enjoy your social dancing (like every Friday at Swingin' at The Mint Tavern) even more. Is Swing U! a social dance? No. Swing U! is solely focused on improving your dancing through a class and structured practice. Join us every Friday at Swingin' at the Mint Tavern, with music starting at 8:30p, or every Fourth Saturday of the month at that Saturday Night Swing Fling. Visit www.facebook.com/SwingDanceVegas and click on the Events page for more information.